Simvastatin (Zocor) is a hypolipidemic drug belonging to the class of pharmaceuticals called "statins". It is used to control hypercholesterolemia (elevated cholesterol levels) and to prevent cardiovascular disease. Simvastatin is a synthetic derivate of a fermentation product of Aspergillus terreus. The development of simvastatin was closely linked with the research and development of lovastatin. Biochemist Jesse Huff and his colleagues at Merck began researching the biosynthesis of cholesterol in the early 1950s. In 1956, mevalonic acid was isolated from a yeast extract by Karl Folkers, Carl Hoffman, and others at Merck; while Huff and his associates confirmed that mevalonic acid was an intermediate in cholesterol biosynthesis. In 1959, the HMG-CoA reductase enzyme (a major contributor of internal cholesterol production) was discovered by researchers at the Max Planck Institute. This discovery encouraged scientists worldwide to find an effective inhibitor of this enzyme. 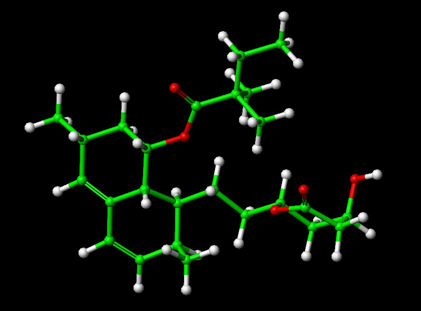 By 1976, Akira Endo had isolated the first inhibitor (Compactin, ML-236B) from the fungus, Penicillium citrinium in Sankyo, Japan. In 1979, Hoffman and colleagues isolated lovastatin from a strain of the fungus Aspergillus terreus. While developing and researching lovastatin, Merck scientists synthetically derived a more potent HMG-CoA reductase inhibitor from a fermentation product of Aspergillus terreus, which was designated MK-733 (later to be named simvastatin). Simvastatin was demonstrated to reduce older adults' chances of developing dementia by more than half. It was also found to reduce the risk of Parkinson's disease by 49%. All statins act by inhibiting HMG-CoA reductase, the rate-limiting enzyme of the HMG-CoA reductase pathway, the metabolic pathway responsible for the endogenous production of cholesterol. The drug is in the form of an inactive lactone that is hydrolized after ingestion to produce the active agent. It is a white, nonhygroscopic, crystalline powder that is practically insoluble in water, and freely soluble in chloroform, methanol and ethanol. Grapefruit contains the flavanones naringenin and bergamottin, which inhibit the liver cytochrome P450 3A4. This in turn slows metabolization of simvastatin and a large number of other drugs. Therefore, patients taking simvastatin should restrict their intake of grapefruit and grapefruit-containing products. Common side effects (>1% incidence) may include abdominal pain, diarrhea, indigestion, and a general feeling of weakness. Rare side effects include joint pain, memory loss, and muscle cramps. Olivia Williams, Anne-Marie Jacks, Jim Davis, Sabrina Martinez (1998). "Case 10: Merck(A): Mevacor*", in Ed. Allan Afuah: Innovation Management - Strategies, Implementation, and Profits. Oxford University Press. Retrieved on 2006-07-19. Wolozin, B; Wang SW, Li NC, Lee A, Lee TA, Kazis LE (July 19, 2007). "Simvastatin is associated with a reduced incidence of dementia and Parkinson's disease". BMC Medicine 5: 20. doi:10.1186/1741-7015-5-20. PMID 17640385. Retrieved on 2007-09-24. Grapefruit (English). Retrieved on 2006-09-15. Gen-Simvastatin - Drug Factsheets - C-Health. Retrieved on 2007-08-15.